NAVAL, Biliran, (DPWH-BDEO) – Women employees of the Department of Public Works and Highways (DPWH)- Biliran District Engineering Office participated the 23rd Provincial Women’s Congress on Wednesday, March 14 held at the Activity Center, Capitol Grounds, Calumpang, Naval, Biliran. 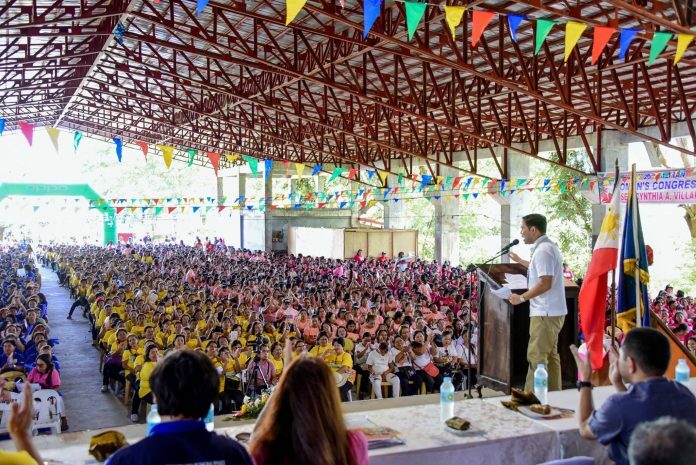 There were an estimated 3,000 women-participants coming from the 132 barangays, 49 sitios, and 186 chapters of Women for Rural Development – Katipunan ng Liping Pilipino (WORD-KALIPI) province-wide, Provincial Council for Women’s Welfare, Incorporated (PCWWI) officials and members, women legislators and other women sectors in the province who joined the said activity. There were also slogan writing contest, dance contest and skills training simultaneous with the plenary sessions: skirting, stage decoration, marcotting and grafting, make-over and vermicomposting. Other activities during the celebration includes the tradefair which showcased the livelihood projects of women. DPWH Secretary Mark A. Villar graced the occasion as the keynote speaker during women’s celebration in behalf of his mother Senator Cynthia A. Villar.